Ramses is a very young African Ringneck Parakeet; so young, in fact, that his neck ring hadn't even developed until just recently. He is very shy and sweet, and will need a person who will patiently work to gain his trust. 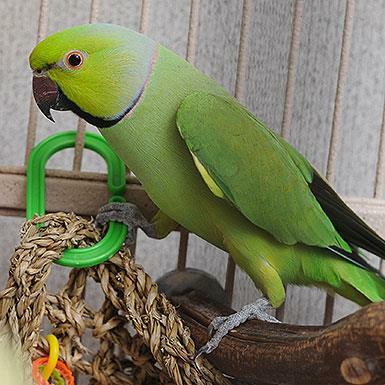 Ramses was born in 2014 and a ringneck's average lifespan is 30 years, so he has a lot of time to give the right person.